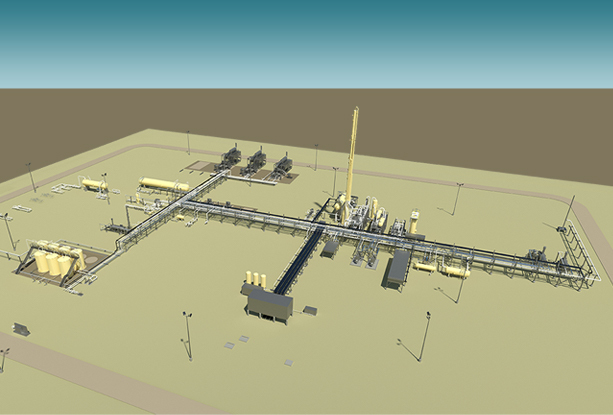 LOCATION: Western Delaware Basin, U.S.A.
Producers Midstream, LP ("PMLP") awarded F&C Engineers, LLC the design of a 60 MMSCFD Cryogenic Processing Plant. The new facility will be a natural gas gathering system and up to 260 million cubic feet per day (MMscfd) of cryogenic processing capacity (“The System”) in the Western Delaware Basin through the formation of Culberson Midstream LLC. The System is anchored by more than 40,000 net dedicated acres and a 1,000 square mile area of mutual interest from Charger Shale Oil Company (“Charger”). Culberson Midstream, operated by PMLP, will provide Delaware Basin producers with competitive midstream solutions for gas, oil and water. Equipment Includes: Pig Launchers and Receivers, Slug Catcher, Inlet Separator, Condensate Stabilizer, Overhead Compression, Molecular Sieve Dehydration, Molecular Sieve Regeneration, Mechanical Refrigeration System, Cold Separator, Cryo Unit, Turbo Expander/Compressor, Hot Oil System, Residue Compression, MCC, Utilities, Flare Knock-Out Skid, Flare. Click image below to view more. Click the links below to view examples of our work. F&C Engineers provides full services from concept to start up for the oil & gas gathering and midstream industries, upstream and power generation industries. We serve our clients globally with more than 30 years of industry experience. Our staff of multi-disciplinary professionals can assess, solve, plan, budget, design and construct ingenious solutions to complex projects. Utilizing proprietary state-of-the-art technology, F&C delivers unmatched quality, budgets and schedules adding value to our client's return on investment.